[And the Stockings were hung…. Let me just say that this one is the end result of stumbling around Pinterest and looking at printed signs, rustic hangings, etc. I think we were also inspired by attending a holiday extravaganza locally. Here’s Your Christmas Sign is my daughter’s, Falon, idea. I did make it and improvised a bit on the lettering as we couldn’t find a font for the Cricut we liked well enough to use. Anyway kudos and credit to the kiddo, Alexis Sanghera. Print the message on the Scrapbook Paper. Our font is Harlow Solid Italic in size 90 in a Laser Printer. Trim the message to 4 3/8 x 11”, punch the corners as desired. Modge Podge message to board, coating the back of message, centering, and coating well. Be careful not to drag the brush or sponge across the print, use a tapping motion to prevent smearing. With an awl, scissor or any pointed tool, punch starter holes for eye hooks at top edge of board 2” from each end. Screw eye hooks into board. Punch starter holes for cup hooks on lower edge, one at center and one at 3” from each end. Screw cup hooks into board. Pull ribbon through left eye hook from back to front. Leaving a 7-8” tail, tie a 4” bow in front of eye hook. Draw ribbon through second eye hook from back to front. Leave 17-18” of ribbon for hanging and tie a 4” bow in front of eye hook. Cut ribbon, leaving a 7-8” tail and trim ends as shown in photo. I like this rustic little sign. Think I’ll hang it on the porch rail or a door. 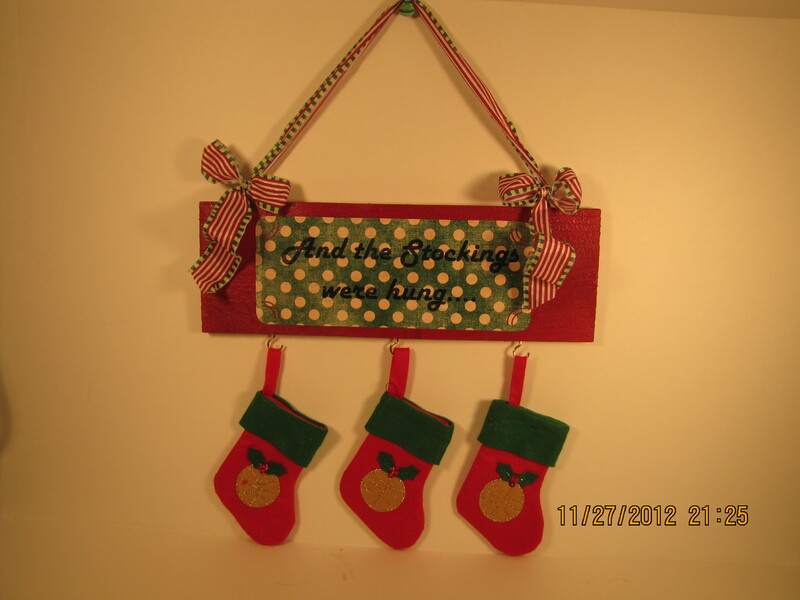 It would be really cute hanging above the mantle and the family stockings. There are so many decorating ideas posted on Pinterest, it would be difficult not to want to add bits of fluff to the everyday. If I build them, they will be used. I use them at the craft table (made of the old front door), and for storage of books and papers. 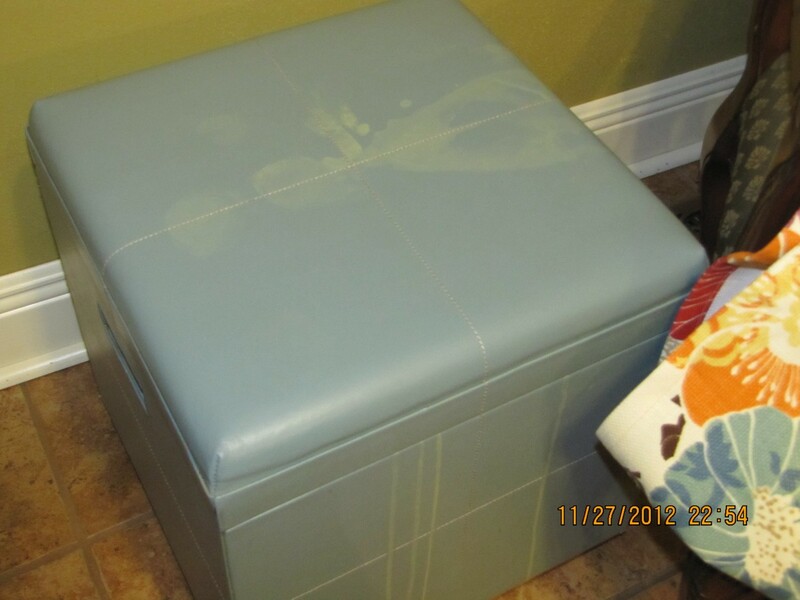 We have another ottoman of teal leather that I managed to stain with salt and vinegar and aloe when I ran into a hornet’s nest with the lawnmower. My legs got the worst of it and the ottoman served as the prop for medication attempts. 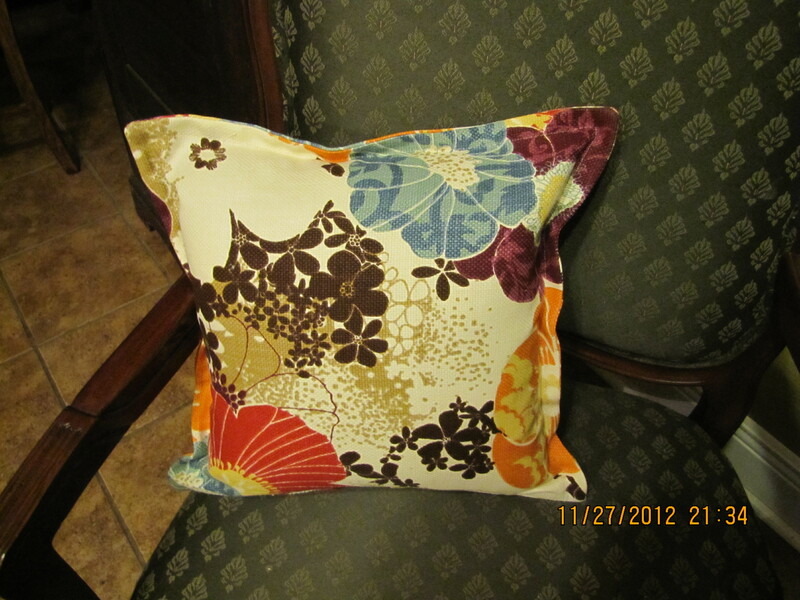 I had lots of fabric so I made a pillow cover as well. I’m just giving a brief description of the how-to on this one with a few hints. Ottomans vary in size. Thread, Velcro, and other notions. 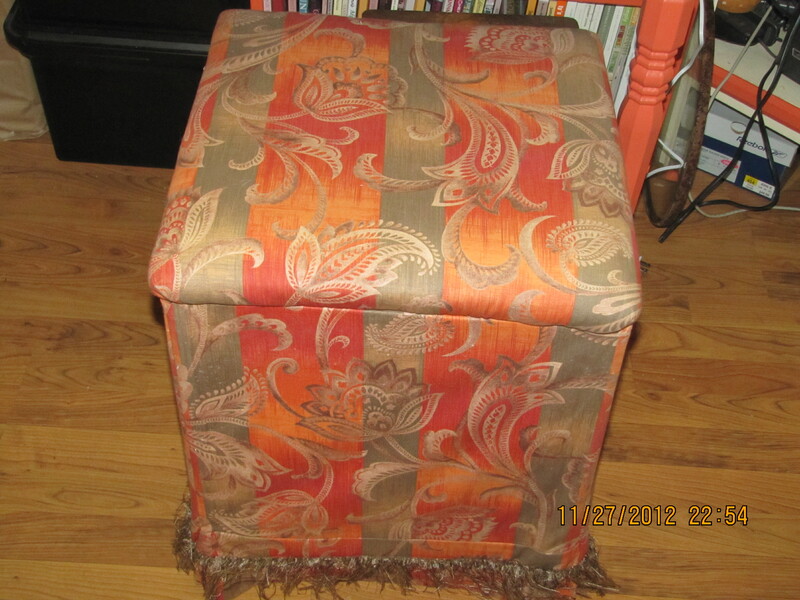 Measure ottoman top. Mine was approximately 16 ½” square on top and sides. Cut the top. I cut a 17 ½” square. Measure sides. All 4 sides of mine were 16 ½” square measuring just the leather portion. I decided to take the fabric a bit closer to the floor and included the legs in the length. Cut 4 sides. I cut 4 pieces 17 ½” wide x 18 ½” long. Matching the width of the sides to the top and with right sides together, sew the 4 sides to the top beginning ½” from corner and ending ½” from opposite corner. 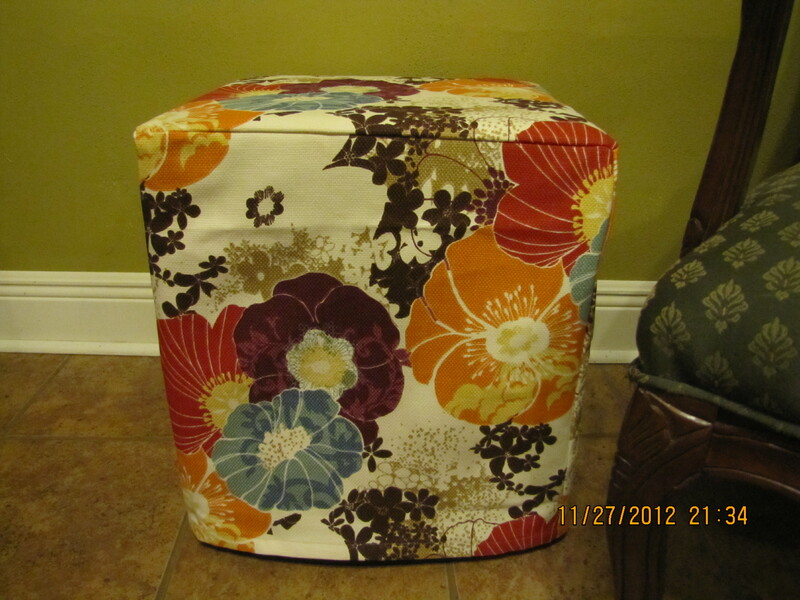 I always make an easily removable cover for my decorative pillows. I have dogs. Dogs get smelly and mine like to push my pillows around and wallow on them. If I buy a pillow that doesn’t have a removable case, I will split one seam, make a muslin cover for the stuffing and add Velcro to the ‘cover’ to make it removable. I had a 16 ½ “square pillow form for this one. Allow 1” on three sides for seam allowances, and 1 3/4” on fourth side and cut 2 pieces of fabric to size. I cut two 18 1/2 “ x 18 3/4 “ pieces of fabric. Turn hem. Fold up 5/8”, press, and fold up another 5/8”. Press again. I had 2 18 ½ x 17 ½ pieces at this point. Stitch Velcro to wrong side of pressed edges, beginning and ending 1 ½ “ from edge. With right sides together stitch a 3/8” seam around remaining 3 sides of pillow, included hemmed edges. Trim seam and corners. Turn and Press. Stitch 5/8” seam around leaving Velcro opening free of stitching. If you have any questions, leave a comment and I will get back to you.